During the season, June through October, members meet at pre-determined pick-up locations to receive that week’s share of the harvest. Members are asked to bring their own bags or boxes to take home their vegetables which helps us to cut back on waste. In addition, we provide you with recipes and cooking tips to keep you inspired in the kitchen, as well as newsletters to keep you informed of what’s happening on the farm. Members can sign up for a full share of 18 weeks, or a half share of 9 weeks, picked up every other week. The fall veggies will consist of seasonal hardy veggies (such as storage crops) as well as some more tender veggies and greens from our greenhouse. Save when purchasing a summer and fall CSA together before June 30th! 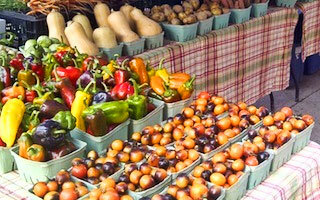 Receive bonus gift certificate for our farmers' market stall when your purchase of a CSA share is paid in full by February 28th! Weekly CSA share purchases paid in full by February 28th will receive a $30 credit to use in our webstore. 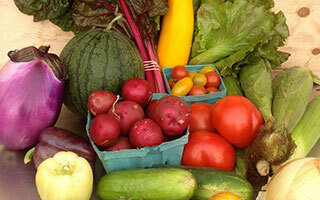 Bi-weekly CSA share purchases paid in full by February 28th will receive a $15 credit to use in our webstore. The farmigo sign-up process will take you to a payment section where you will be provided with payment options. Members can pay all at once, or in 3 installments. The first intallment should be made at time of sign-up and the final intsallment should be dated no later than June 30th. CSA shares must be paid-in-full by June 30th to ensure delivery of your CSA share. Please let us know if you would like to make alternative payment arrangements, we are very flexible and understanding. Payments may be made through PayPal online, check or e-mail money transfer though on-line banking sent to csa@rootsdown.ca. Though PayPal is the most convenient and automatically updates your account, it does cost us the most money and so the e-mail transfer is preferable to this. We have a limited number of work-shares available. Those interested in this option need to commit to one full day a week of moderate farm work during the season. In exchange, they receive a full CSA share as well as extra veggies for canning. Please contact us for more details. How many people does each share feed? This depends on each household’s weekly eating habits. For vegetarians who cook all of their own meals, they may go through a share in a few days. Others comment on how well the veggies keep and that it takes them a while to get through everything. Many people who are unsure will often start off with a half-share and can bump up to a full share later in the season if they like. To help gauge how the CSA would suit your household’s needs, please see our projected list of weekly CSA boxes. You may also visit our Facebook page to view the pictures of each weekly share over teh past few years. What if I’m away and can't pick-up my share? Many people will have a friend or family member pick-up their veggies for them when they are away. This makes a great gift for your house-sitter! However we understand it can be disappointing to miss receiving your veggies. We are currently using a web based softmare system called "Farmigo" to help us to better manage our CSA program. With this system there is also an online store feature which will allow people to place orders and have veggies delivered to CSA pick-up locations during the same alloted time of the CSA pick-up. Through this, CSA members can also manage their own accounts and put their delivery on hold in anticipation of a vacation. Full CSA members have the option of doing this twice in the 18 week season and half-csa share individuals have the option of doing this once. Members will be given 25 store credits to use in the on-line store for their vacation hold. One credit is equal to $1. In order to receive credits for missed veggies, a delivery hold needs to be placed on your account no later than 2 days prior to a pick-up date. Credits will be applied to the account after the scheduled delivery hold date.